Recently I’ve heard Posole mentioned a few times on the TV and then read about it in the newspaper. To me that’s a sign I need to get cooking. 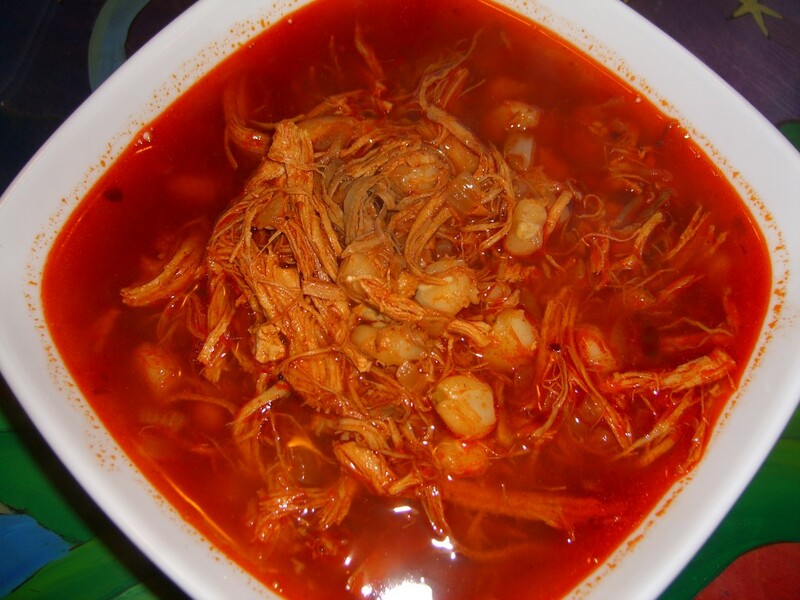 Posole is a traditional Christmas Eve soup served in New Mexico. It’s known as a ceremonial dish for celebrating life’s blessings. I didn’t want to wait until Christmas and since every day should be celebrated, I gathered my supplies and got cooking. Oh and by the way, it’s naturally gluten free and dairy free. Posole corn is prepared by soaking hard kernels of field corn in powdered lime and water. After several hours, when the corn kernels have swollen, the liquid is allowed to evaporate and the kernels to dry. Posole is different from hominy, another kind of processed corn, which tends to be softer and more bland. Compared to hominy, posole’s flavor is intense and earthy, its consistency more robust. It’s difficult to find posole corn, so in it’s place I used hominy. Hominy is often used as a substitute in posole stew. The liquid base for this stew is a combination of stock and pureed peppers. You can use chicken stock, pork stock or vegetable stock if keeping it vegetarian. Over the weekend I cooked up a new batch of Scrapple to have on hand for school morning breakfasts. I reserved some of the extra pork stock and used that in this stew. Making this stew does take a little work to prepare the peppers, but it’s totally worth it. It creates a soup that has a deep rich taste with many layers of flavor. I hope you will give this recipe a try and see for yourself. This recipe made enough for 6 large bowls of soup so you know where the leftovers ended up. Right in my freezer for a quick meal on a soccer night! Note- this can easily be made vegetarian/vegan simply by changing out the stock for a vegetable stock and not adding in the meats. Cut the tops off the dried peppers and shake out the seeds. Place them into a pot and cover with water. You’ll want lots of the liquid that the peppers cooked in leftover to use in the base for the stew. Turn the peppers on high and bring to a boil. Turn down and simmer for 20 minutes. Let them cool off a little before putting them into a blender. If they are still hot make sure the blender top has an escape for the steam. It’s better to wait a little and not impatient like me. While you’re waiting for them to cool, cook up the onions and garlic in your stock pot in a little oil until translucent. To this you will add in the ingredients to build the stew. Back to the peppers. 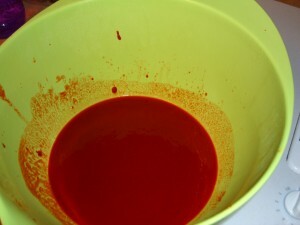 Puree the peppers in the blender with a some of the liquid they cooked in. 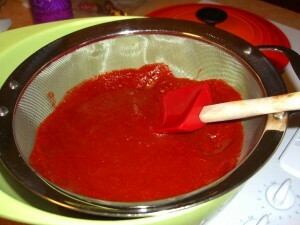 Pour the pureed peppers into a strainer and using the back of a spoon or a spatula press it through the strainer. 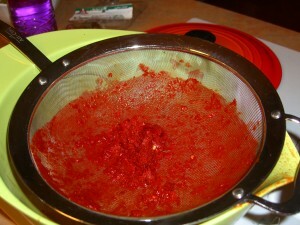 You can see what is left behind in the strainer and what came through the strainer. Pour the thick liquid that came through the strainer into your stock pot. 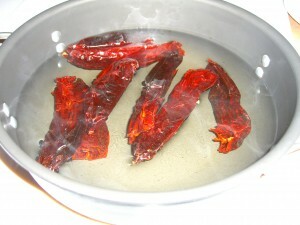 Add in any remaining liquid from the peppers that you strained into the pot and the chicken or pork stock. You’ll want enough liquid to support the meats. Add in the meats, oregano, salt, pepper, and hominy. Bring to a boil and then turn it down to cook on medium low for 30 minutes. Most people serve this dish with accompanments to sprinkle on the top. 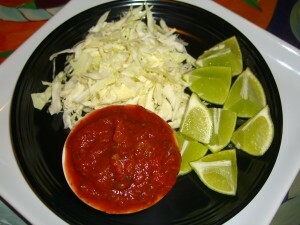 I only had limes, cabbage, salsa and tortillas but often radishes are included. Don’t forget to check out What can I eat that’s gluten free. Update: This was submitted to Slightly Indulgent Mondays at Simply Sugar & Gluten Free. To make this a little healthier you can omit the pork. Christmas Eve soup sounds perfect where I live in Michigan! I am freezing cold this morning!! Michele- I bet it gets real cold in Michigan. They say it's supposed to be a frigid winter here in VA this year. I hope they're wrong. We'll be eating soup every meal! I used to live in Taos, NM and posole was always our New Year's Day meal. It still is, even though we're now in Colorado (which has strong Mexican roots as well). Posole brings good luck to the upcoming year. Good way to start out the next 365 days. Also a good way to celebrate Christmas Eve. I love it and everyone has their own version of how to make it. I usually use a mixture of red and green chile. Fall brings in the chile harvest and I roast and freeze a bunch (I mean a BUNCH) of green chile in separate bags, then use it for times like this. I like blended red and green, but there are as many ways to make this as people celebrating life. Good one, Diane. You've got me in the mood! Melissa- I've seen this soup with green chili's too. I bet it's good either way. I'd love to hear what you include in your posole. I'm finding a new love for chilis and trying to learn more about them, their tastes and uses. I'd love to hear more about the types of green chilies you harvest. I hope you share that on your blog. I think I'd like to roast and freeze a bunch too. Still trying to figure out what to do with all of the different dried chili peppers I grabbed at the Hispanic Food Mart. I need to get a good book on chilis. If you have one, let me know. I have been meaning to make a pork posole for what seems like forever. I need to get off my lazy tail and get to it! This sounds delicious. Alta- I'd love to hear what you add to your posole. I really loved this dish and hope to keep making it. I like to change things up when I make them over and over. It keeps it interesting. I've never heard of posole. I think I would like it if it weren't for the peppers, but that's a key ingredient in this dish! Thanks for sharing it at this week's carnival. You always have something interesting! We are so much alike…I see something a few times and then I must cook it – it’s like a switch flips somewhere inside of me. I have come across the best food this way and it really satisfies my need to learn. Your soup looks great…I love shredded chicken in soups, too. The texture is amazing. I love mexican dishes yet I don't think I've ever made a mexican soup. This looks delicious, I'll have to give it a try. Brian- I'd love to hear your version when you make it. I know I already commented but wanted to say thanks for participating in Slightly Indulgent Mondays! This is a great addition to the other fabulous dishes that have been submitted. Want a good giggle?? 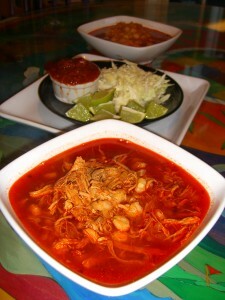 Just told a friend eariler today that I'd do a guest post for her blog with a chicken posole stew. Great minds think alike!! Amy- Love posole. Send me the link. I'd love to see your version. I haven't done much with reconstituting peppers, but we sure love peppers. I'm feeling braver about it after seeing your soup! Trish- It's really not that difficult to cook and puree the peppers. You just need a blender and a sieve. If you have that you'll be good to go! Let me know if you give it a try. This recipe looks delicious, thanks for posting it, it must of taken alot of time and effort. I look forward to making it and tasting it as well. Ive been looking for hours on the internet for a recipe that actually looked decent and came from someone who seemed to know what they were doing. Ive had alot of posole here in New mexico, and i look forward to seeing if this is a keeper out of all the other posoles ive eaten. thanks. Jane- wow, a Posole tasting expert. OK, so if you make this recipe please let me know how it stacks up. I will say this soup held up well with being frozen and reheated. This way you can make extra and enjoy it more than once! Can't wait to hear back. Wow! Thanks for this recipe. 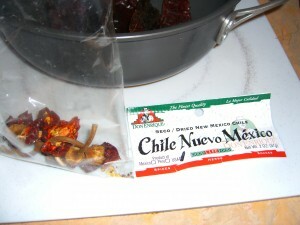 I just returned from New Mexico with a big ol' red chile ristra and wondered what to make with it first. Yours was the first and I gotta say, real tasty. I didn't find reconstituting the chiles difficult at all. I used 10 and got some nice heat and intense flavor. It's a SIMPLE recipe and so well worth the little time it took to make it. Thanks a million – it will stay in my kitchen for all times. Donna- Thank you so much for sharing your experience with me. I have to say I'm so addicted to this soup. Like you I was surprised how easy it was to work with the peppers. Let me know if you start playing with the recipe and make any changes. Always looking for an excuse to make another pot full. Hi Diane: I made another pot of posole, however, this time I used a packet of posole seasoning that I bought in Santa Fe. I am soooo disappointed with this batch. It is lacking, not only the red color, but the intensity, depth and punch of flavor. I had to give it a try, just to see the difference, but I am hooked on yours. This latest batch is okay if you don't know the difference but since I've experienced your magnificent (I mean that!) recipe, I am completely spoiled. I failed to mention that I did not add chicken to my first rendition of your recipe but I will definitely add that little bird next time. I sure hope my boyfriend eats this second batch up real quick so I can get back to making our favorite – yours! We stopped in LasVegas, NM at the Plaza Hotel and had their beef stew soup. Asked for the recipe and they were offering to mail it but never received it. It was chunky, thick, saucy (thick sauce) and after the initial taste there was a smooth heat that grew from the back of your throat and dissipated there. Delicious! Anyone have any ideas how to duplicate such a sensation? I was thinking green chiles but am not sure.